For practice jam sessions with your buddies, professional recording of your tracks for a new EP or to just better your music game, head to The Jam Room in Kammanahalli. With the objective of propagating and augmenting creativity and expression in the musical field, The Jam Room is a space dedicated to any aspiring musician, talented instrumentalist and upcoming band. What is lovely is that it’s not just a space; they offer you an entire fostering musical journey, right from piano lessons, a space for your practice sessions, opportunities to perform at different venues and occasions, and wait for it…record your outcome. If all you’ve ever dreamed about is winning a Grammy, and you even have your acceptance speech ready, make this your base. You could also head here to record voice overs for your short films or jingles for college projects and advertisements for a start up. With all that they have to offer and at reasonable rates, becoming a professional musician isn’t a far fetched dream anymore. Of course, you have to bring the talent, but they have everything else. 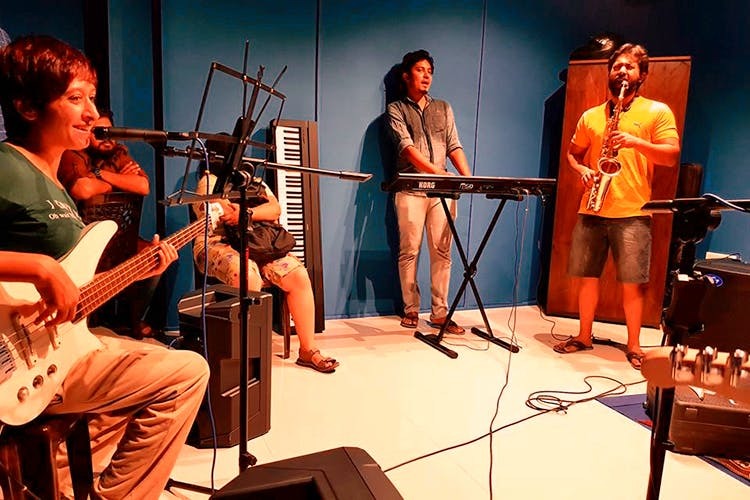 The instrumental equipments such as a stage piano, drum kit, guitar amp, base amp, studio monitors, mixers, mics (dynamic, condenser, drum mics), audio interface and other cool devices are provided by them, all you have to do is carry along any additional instrument you’d like to play. A jam session would cost you INR 400 per hour, vocal recording INR 1,000 per hour and multi track band recordings INR 1300 per hour. Go ahead and get jammin’. And if you need someone to play bass guitar or Cajon, and sing, dial LBB Bangalore. We’ve got your back!